As nature intended! 😀 This is my preferred method to apply foundation as I find it provides the most control and a more natural finish. The warmth of skin on skin contact also helps the foundation to spread easier and meld into the skin. It’s also the most versatile – pretty much all of my foundations can be simply applied with my fingers except for a finicky few. I tend to use my fingers for liquidy foundations or those that require the product to be warmed up against the skin. Examples of foundations suited for applying with fingers: MAC Face & Body, MUFE Face & Body (comparison between these 2 here), The Ordinary Serum Foundation, Shiseido Sheer & Perfect (review here), Holika Holika Aqua Petit BB, and Kevyn Aucoin Sensual Skin Enhancer (this needs warming up). Paddle brushes are used for very meticulous application of foundation and can be tricky to use, as they can cause streaks if not using single direction strokes, like a patting motion. #6 Foundation Brush loaded with liquid foundation. I rarely use these brushes but they can come in handy if I need to smooth out parts of my face like around my nose or hair line. I personally find stippling / duo fiber brushes to leave streaks so I tend to not use them for applying liquid foundation (I prefer them to apply powder blush and bronzer). Elf Stipple Brush with liquid foundation. MUFE #124 Kabuki Brush with powder foundation. I find kabuki style brushes to be best suited for powder or mineral foundation. These are like smaller kabuki brushes with long handles. The kabuki and buffing brushes were first made popular during the mineral powder craze in early the 2000’s. I find the really densely packed buffing brushes to be mainly good for powder foundations. Of these, my favourite is the Bdellium #959 – it doesn’t leave streaks and blends foundation quickly and seamlessly. Bdellium Tools #959 Powder Blending Brush with liquid foundation. Flat top brushes tend to have an almost velvety smooth surface, which makes for an even application of foundation on the skin. Coastal Scents Bionic Flat Top Buffer Brush with liquid foundation. For liquid foundation, I prefer looser packed, slightly floppy bristles which do not smear the foundation around, but rather smooth and blend foundation onto the skin. The oval brushes are essentially buffing brushes turned perpendicular. I first learned of them when MAC launched the Masterclass Oval brushes back in 2013 but most people know of the Artis brushes which came out a couple of years later. The bristles are typically very fine filaments and packed extremely densely – the brush surface feels like velour. What I like about these brushes is how they blur imperfections like pores and fine lines. The application motion with these brushes is a side to side sweeping of the brush to graze over the skin surface. MAC Oval 6 with foundation. Overall, I find that applying foundation using the various brush styles yield the highest coverage and are best for foundations that are medium to thicker consistencies. Examples of foundations that work well using makeup brushes are Face Atlier Ultra Foundation, Revlon ColourStay Whipped, Guerlain Lingerie de Peau (review here), and MAQuillAGE Lasting Powdery UV EX Foundation (and most compact foundations). I dedicated a whole post on blending sponges here: Beauty Blender Battle. I find blending sponges to be best for foundations and concealers with a medium consistency, ranging up to balmy consistency. Anything too runny will absorb too much into the sponge, and anything too thick will have a challenging time blending out. The Face Shop Makeup Blender Sponge with liquid foundation. I primarily like to use dampened sponges to sheer out foundations that I find to be too high coverage. One of the best things about blending sponges is how quickly they blend out foundations to look flawless – I use sponges second only to using my fingers. Speaking of fingers, I’m really liking this new addition to my blending sponge family – meet the Sephora The Pointer Blending Sponge! It fits over my finger so I can blend under eye concealer and around my nose easily. The instructions advise to use it wet – I’ve tried it both wet and dry and I prefer it dry. Examples of foundations that I like using with blending sponges: Maybelline SuperStay Better Skin Foundaion (review here), MAC MatchMaster, H&M All Day Foundation, and Illamasqua Skin Base Foundation. I also like flattened disc style sponges for powder and cream foundations. Not A.I…. yet. But I’m talking about airbrush makeup guns or even the Clarisonic Sonic Foundation Brush. I’ve not tried either of these so I can’t comment – they do require a high dollar investment for the equipment and special supplies first so it’s a commitment. Do any of you have an airbrush foundation gun or tried the Clarisonic brush? That’s my overview of all the different ways to apply foundation! 😀 My go-to foundation application method will always be using my fingers but sponges and brushes are also useful to provide a variety of finishes with different foundations. Are there any other ways to apply foundation that you use? What is your favourite foundation application method and tool? Nice post, super interesting and informative, I enjoyed reading it. I like to apply my foundation with a top flat brush then go over it with a beauty blender. Oh I never thought to do 2 stages with both a brush and a blending sponge! I do often blending initially with my fingers and then with a sponge or brush. I do this too if it’s a thicker or super full coverage foundation. I used to strictly use my hands to apply foundation! But then I tried a brush and preferred it that way. Then I tried a Beauty Blender and preferred that. XD So now I strictly use beauty sponges to apply my foundation! Such an informative post! Thank you for sharing. Great informative post, I agree that the application always depends on the kind of foundation I am using and finish I want. I used to like applying foundations with my fingers but there are some that have better finish with other tools. Flat foundation brush is probably my least favourite because it usually gives me rather streaky finish. I’ve pretty much tried all these methods for foundation and my favorite way to apply is with a sponge. I use my kabuki brushes to buff out streaks if there are any. Have you considered trying silicone sponges? I’m on the fence with them, but they don’t absorb product like regular sponges. I refuse to fall for the silicon sponge gimmick! I’ve not seen a single review that likes them. I might be willing to try if the sponge was $1… maybe! But I think the smooth / non-porous texture of silicone make them useless in blending. I do still like applying concealer with fingers – something about how it smooths the product onto the skin looks the best. I agree, applying concealer with a brush always looks streaky, unless I was just doing pin point concealing. Yes, the RT Expert Face Brush is a great buffing brush! I like it more for powders, personally. I’ve tried the Expert Face Brush with bronzer, what powder products have you tried it with? Powder foundation! It does a great job. I tend to dot a foundation around my face using my fingers and then either buff it in with a brush or blend it out with a beauty blender. I prefer the Sigma F80 round kabuki or the Max oval paddle brush if I’m using brushed. I found that I love the €2 Primark sponge over the €20 beauty blender. I prefer the sponge for thicker/ creamier foundations with more coverage. Everything else that is more lightweight and more sheer with a brush. With a brush I sometimes also like to apply the foundation to the brush, dot that round and then use the brush to blend the foundation into the skin. I only use flat top kabuki brushes for applying powder and I have a classic kabuki brush that I like using for applying my MAC MSF Natural in the summer time. I am quite picky when it comes to how I like to apply my foundation! I’m so over the Beauty Blender! I really like 2 inexpensive ones that cost $5 each! Thanks for describing how you use a variety of tools / methods to apply your foundations. I normally pour / pump foundation onto my hand and dip my sponge / brush to apply to my face. If I’m just using my fingers, I’ll dot straight onto my face. I use a kabuki to apply the MAC MSF Natural too! 😀 I want to get a larger size Oval brush so I can do my foundation even faster! That’s why I’m so happy with my €2 dupe! And I love it when people leave comments that actually go into my blog posts too. I just felt inspired to write that down on my morning commute. Great, and informative post!! I use the real techniques buffing brush for all my face makeup if you can imagine that 😂 foundation, concealer, powder, bronzer, blush – everything with one brush! It’s not because I’m cheap, but it just works for me 🤷🏻‍♀️ I used to be a finger foundation application person but the brush experience was better! Wow, that ONE brush can do all that! So impressive! I think it’s great! I’ve love to find one brush that does it all. 😀 I think I own that brush… will have to test it! I prefer my sponges but I have a couple foundations that apply better with a brush. Pro tip: Wet your sponge with WARM water to make it work more like your fingers. You’ll definitely see a difference. People wet their sponge using COLD water?! I don’t like putting my hand in cold water so that thought never occurred to me! What’s your favourite blending sponge? Beauty Blender? I do love the Beauty Blender. BUT… the pink L’Oreal sponge works just as well and costs so much less. I need to get a new one as my original I got back in April has just about had it. I love my Danielle Creations sponges a lot too. I onLy own the Shiseido fLat top brush but after seeing those fLuffy kabuki brushes I kinda want one..
Do you have any recommendation for retractabLe kabuki brush? I actually don’t like that Shiseido flat top brush! I’m going to declutter it soon. I find it pushes foundation around rather than blend – it’s too dense, in my opinion. Awesome post! Like everyone said, very informative and well thought-out. I have never, ever liked using brushes to apply foundation – the foundation just never sat well on my skin from applying it that way. I always used my fingers up until I received that Quo sponge from you, and now I’m addicted to using sponges! Glad I was your gateway to blending sponges – besides the Quo one, what other brands have you tried? I’ve only ever used the Quo ones! I should probably branch out but if I find something I like, I have a habit of sticking to it…bad beauty blogger! I forgot to mention – I would love to try applying foundation using the Clarisonic! I own a Clarisonic Mia but I *think* the foundation brush head only comes with the regular Clarisonic! I just checked – the Clarisonic foundation brush fits onto the Mia too! The best in cleansing just got better. Get the most even, full coverage from your makeup! The Sonic Foundation Brush uses patented oscillation technology to generate more than 18,000 micro-blends per minute. It gently provides a flawless, full foundation coverage in 60 seconds or less. Spend less time, waste less foundation & get better results. Let sonic micro-blending do the work for you! Made with synthetic fibres, easy to clean, just like your make up Brushes! Simply spray with brush cleaner or wash with brush shampoo! Use dry. These days I apply with my fingers and then use either a sponge or my Wayne Goss foundation brush to blend out. 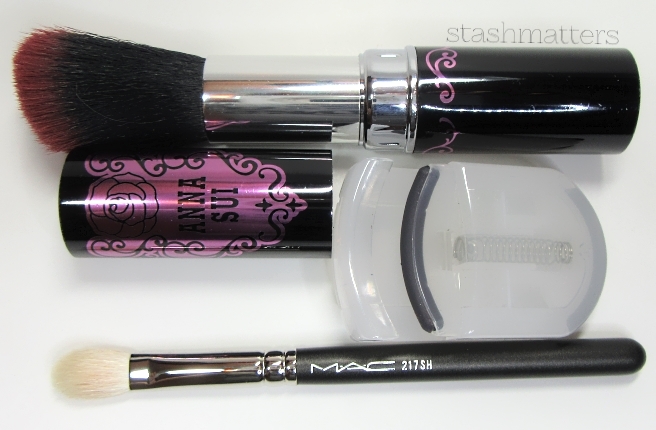 For powders, I have a few different brushes that I use – with my fave being the giant Tarte one. I have to try Wayne Goss brushes one of these days! Isn’t his foundation brush made of white goat hairs? I think so. They are really great quality (hand crafted in Japan). I like using flat foundation brushes for face masks. I have a real aversion to sticking my fingers in things, so using my fingers foundation is a no go. I have been loving using a ‘toothbrush’ style brush for applying foundation, but nothing works like a mini blender for concealer! I know lots of people who don’t like using their fingers to apply foundation. I don’t necessarily need to stick my fingers into anything – just pump the foundation onto my palm and then use my fingers to apply from my palm to my face. I’m a serial hand washer so I’m not concerned about that. You write the best and most detailed blog post. I am so keen to try oval brushes now. sponges wins the battle in my case. and it is easier to clean a sponge than a brush. I agree, sponges are way easier to clean! I’m happy to hear I’m not the only one who loves to apply foundation with their fingers. More power to us! Well when you look at the pros for using fingers to apply foundation – it’s FREE – it makes a lot of sense!